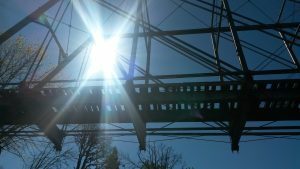 September 28, 2018 – We are expecting equipment and planks to arrive in the next few days to begin the decking of Hayden Bridge. WE are keeping to the original layout to the railbed of the bridge. We will need help with railing though, it will cost about $150 per foot or right about $60,000. I think the local community might help with that, once they see progress on the bridge. Our anonymous donor, to which we are very grateful, only wants the bridge to stand for a very long time. I did nix the idea of a grated deck – not good for dogs. 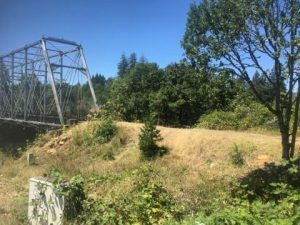 January 4, 2018 – Over the 2018 winter we started working the site at Hayden Bridge with Gene Burks to clear overgrown blackberries, vines strangling the firs and creating views of the bridge that haven’t been seen from Marcola Road in some time. We also met with the local parks district as part of their land and trails acquisition in their next master plan. This bridge would hub a great park on the McKenzie River in Springfield, Oregon and create the northern gateway to the city. We had plans to plank the bridge within the original railroad curbs. We have modified those plans to have a wider crossing for the intended multi use. 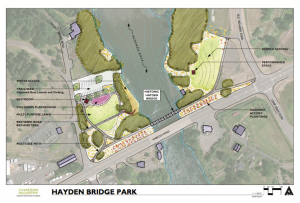 Local landscape architect and planner has developed Hayden Bridge Park sketch. The coolest thing is the bridge though, and the reason we had to save it because of it’s rarity. 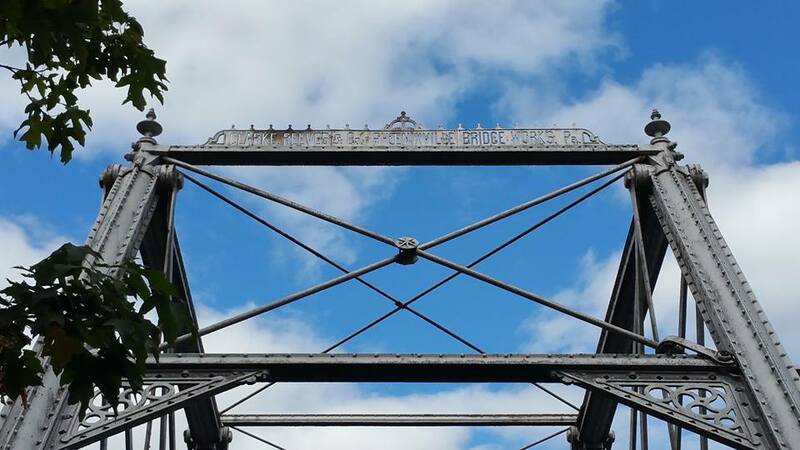 It is a double intersection Whipple truss, created by Clark & Reeves, predecessors of Phoenix Bridge Co. Made of cast and wrought iron parts, the bridge first served in the 1880s as a crossing on the transcontinental railroad of the Black River in ,,,,,, Utah, just twenty miles from the location of the golden spike. In 1896, disassembly commenced and it was moved to Oregon for the purposes of running logging trains from Wendling to Springfield. 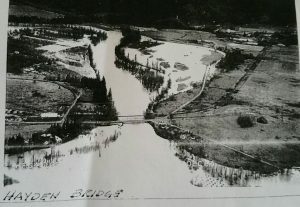 There is detailed history on the setting of the bridge in it’s new location. Owned last by Weyerhauser, it was decommissioned in 1989. Workin’ Bridges stepped in with a plan to save the bridge in place when efforts to remove the bridge and store it proved to be very expensive. There is an extensive historic document collection on the erection of the bridge and the railroad to Wendling. Our efforts continue in Oregon in the fall of 2018.